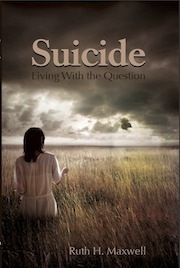 Suicide – Living with the Question moves far beyond the personal narrative and into the realm of spiritual, philosophical and psychological questions that arise in our attempt to understand such an inexplicable event and find the meaning within. It is written on a personal level in clear, accessible language, and balances the reflective process with research based science. One of the most important aspects of the book is the examination of social norms and prevailing attitudes about the subject. It takes a hard look at the subject of self esteem and the images we project of ourselves and various societal factors that lead to denial and, consequentially, the inability to recognize the signs and signals when someone may be at risk. I have the deepest admiration and respect for the strength, patience and great fortitude it took to write this important book. I must confess that it also required courage for me to read it, because Bill was my cousin. Reading the book has been a stunning revelation to me and a journey of self discovery that brought me to tears on more than one occasion. I learned of Bill’s death when I was far away from home and had fallen out of contact with much of my extended family. I couldn’t begin to fathom how or why something like this could possibly have happened and never talked it through it with anyone. I still hadn’t completely come to terms with the tragic death of my own younger brother not that many years earlier and now Bill’s death was something I couldn’t really wrap my mind around. I was at a loss as to what to do. Before I knew it, years had passed and I had never taken the time to try and understand it or to fully reflect upon it. Reading Ruth H. Maxwell’s book provided a bridge back to that lost part of my family history and gave me back a piece of myself. It allowed me to emotionally process the narrative of my cousin’s death and the effects it had upon his immediate family, close friends and colleagues. On a personal level, the book also helped me to examine my own questions, and to acknowledge my sense of loss as well as feelings of grief, guilt, shame, blame, regret and acceptance, and a whole spectrum of other emotions. I think one of the most important conclusions in the book is the significance of post- traumatic stress disorder and clinical depression as critical factors that may contribute to a decision to take one’s own life. The way this book raises awareness and sensitivity to these conditions, and the importance of bringing it all out into the light of day conveys a timely and powerful message. It is a profound reflection about loss, redemption, hope, forgiveness and perseverance and an invaluable resource for educators, counselors, health and spiritual practitioners, parents, friends and all of us. Michael Gillan Maxwell is a visual artist, writer, editor, teacher and educational consultant. He lives with his family in the Finger Lakes Region of New York State. I’m so sorry for your loss. I hope your cousin knows what an amazing woman she is for writing this book and creating awareness of a struggle you spend so much energy fighting, that you have none left to even try to make others understand. I hope it helps her even just a bit to know he’s no longer in pain now; that it wasn’t her lack of love that made him give in, it was simply the pain of his world that was just too much to bear. When your pain outweighs your happiness it begins to smother you until each breath feels like your last; I assure you his last breath was one he fought for – because we fight everyday that we live with this illness. We fight to survive. I’m so sorry he lost his battle, but I’m so grateful that with this book your family is helping others to win theirs. I feel kind of silly for writing all of that now, sometimes I don’t really think before I click ‘reply’ and before I know it I’ve completely overshared with some stranger. Sorry I really just wanted to thank you and say that he may be gone, but he mattered – and he still matters. Not at all!!! No need to feel silly. You didn’t over share and I was so touched by your comments. I just finished e mailing a copy of your response to my Aunt Ruth who wrote the book because I think it’s important for her to know that her book is touching people who haven’t even read it yet. Thanks again for your response and good luck with your training! Keep at it! I’ll be picking up a copy on payday 🙂 Thank you. Hi Michael, Thank you for sharing this book about your cousin. What a gift – for your Aunt has created – to not only tell the story of her son, but to face the questions that suicide brings. Unfortunately, I have had too many friends who have been affected by this unthinkable act. Three women i know have lost young sons, and recently, 2 adult men, husbands of friends have faced the questions that follow. I may recommend this book to one of them – I’m not sure the others are ready. p.s. I love your Backyard writing, but never tell you. I spend as little time as I can online, so i haven’t commented. But, you are an amazing writer, and your style is so easy, for me, to engage. Thanks! Wow! Diane ~ how wonderful to hear from you. I am so humbled and honored by your comments and your sharing. Ruth’s book was a revelation to me for some many reasons and on so many levels. She was recently contacted by a veterans association about the book because so many servicemen are returning from the mideast with PTSD and suicide is epidemic. Thank you again. I forgot to mention the book is available on Amazon. We just got back fro a blitzkrieg trip to Cleveland. I have some business commitments that may prevent my going in january, but I’m sure Ileen will be going then. Keep us posted.